Do I need a referral from the dentist? No you do not need a referral. At Family Dental Care our dentists are not orthodontists and do not offer orthodontic treatment. However our dentists will check dental development at each check-up and advise the patient/parent/carer if an orthodontic opinion should be sort and provide a referral. Although the orthodontist is restricted in the sense that they cannot do general dental treatment, the dentist and orthodontist work together before, during and after orthodontic treatment to give you the best level of care. The Australian Society of Orthodontists advise that an assessment by a specialist orthodontist for children aged 8-10 years is encouraged. At this stage they hope to diagnose, and sometimes start, interceptive orthodontic treatment for some teeth and bite issues. 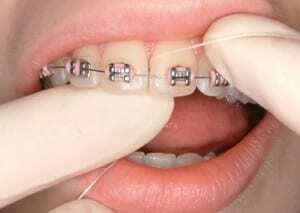 This may prevent the need for more complicated orthodontic treatment later. It gives the orthodontist a chance to assess and monitor the child’s dental development and plan an appropriate treatment schedule. Also, early intervention may prevent more serious problems from developing or make treatment at a later age shorter and less complicated. However, in most cases, orthodontic treatment is commenced as soon as the last baby tooth has been shed. This usually occurs around 12 to 13 years of age. In the past, orthodontic treatment was generally restricted to children. However, the basic process involved in moving teeth is the same at any age and orthodontic treatment is also successful for adults. This is because an adult’s facial bones are no longer growing, however, some severe problems cannot be corrected with braces alone. Should I visit the dentist if I am having orthodontic treatment? Yes! 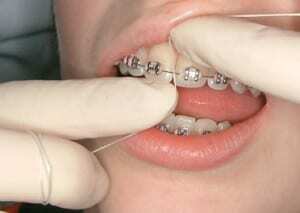 Visiting us becomes more crucial when undergoing orthodontic treatment. If your oral hygiene is not properly maintained during treatment, bacteria can build-up and cause tooth decay or gingivitis. The best way to remove the build-up is with a toothbrush first, then Piksters and lastly, floss. Also, the orthodontist may need some teeth removed prior to starting treatment or suggest you have fluoride regularly during treatment and this can only be done by a dentist. How do I floss with braces on? Try buying a brand of floss that has a waxed tip (sometimes called ortho floss or super floss) so it’s easy to thread between the wires. If you can’t find that, try normal floss. Break off a piece about 30 cm. Thread it under the wire as shown. Then pass the floss between your teeth as shown. Scrape downwards against the sides of the teeth. Don’t go too far under the gum and don’t hurt yourself. You just want to scrape out the plaque and food between your teeth. Pull out the floss and thread it under the wire of the next tooth.